Once the pricelist has been retrieved, you will be prompted to select how you wish to pay for your purchase. 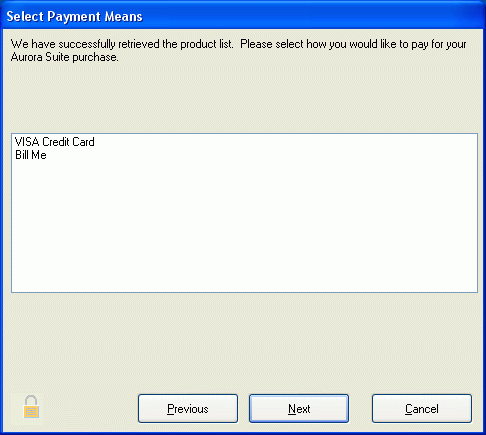 Highlight the payment means you choose using the mouse or keyboard. If you choose a credit card payment, once you submit your order for processing, you will be provided a serial number that will operate in All-Day Demo mode for up to 30 days. Once your credit card payment has been processed, the software will become available for activation the next time you start Aurora Suite, typically within 24 hours. If you choose Bill Me, once you submit your order for processing, you will be provided a serial number that will operate in All-Day Demo mode for up to 30 days. You will also be sent an invoice for your purchase via mail. Once payment for the invoice has been processed by Aurora Systems, your software will become available for activation the next time you start Aurora Suite. If you are a reseller, you may choose either payment method. Once your order has been processed and accepted by Aurora Systems, the software will be available for activation immediately. Press this button to confirm your selection and move to the next step. If you have not made a selection, you will not be able to proceed.